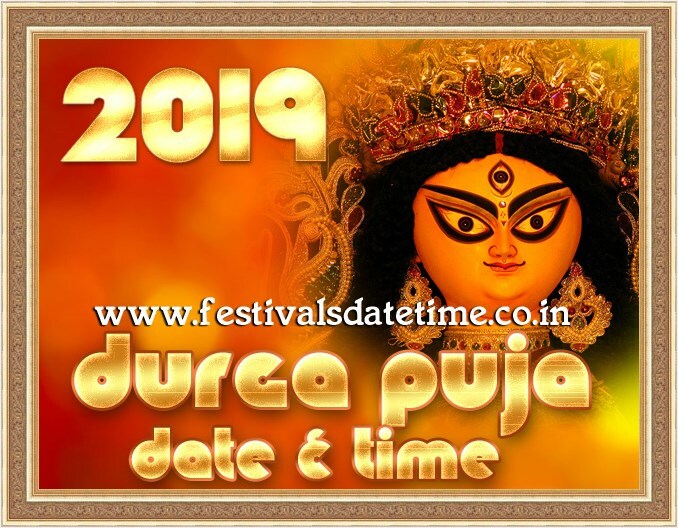 Durga Puja 2019 all dates & time in India. Durga puja is a biggest festivals in India. About Durga Puja : Durga Puja, also referred to as Durgotsava or Sharadotsav is an annual Hindu festival in South Asia that celebrates worship of the Hindu goddess Durga. It refers to all the six days observed as Mahalaya, Shashthi, Maha Saptami, Maha Ashtami, Maha Nabami and Vijayadashami.Durga Puja festival is celebrated from the sixth to tenth day of bright lunar fortnight in the Hindu calendar month of Ashvin. This period falls in the fortnight corresponding to the festival is called Devi Paksha. Devi Paksha is preceded by Mahalaya, the last day of the previous fortnight Pitri Paksha, and is ended on Kojagori Lokkhi Puja.